Tib-ong Mangkas Art Group (Onward Mangkas Art Group) is newly formed group of La Carlota City budding artists in their own field of skills and specialization. 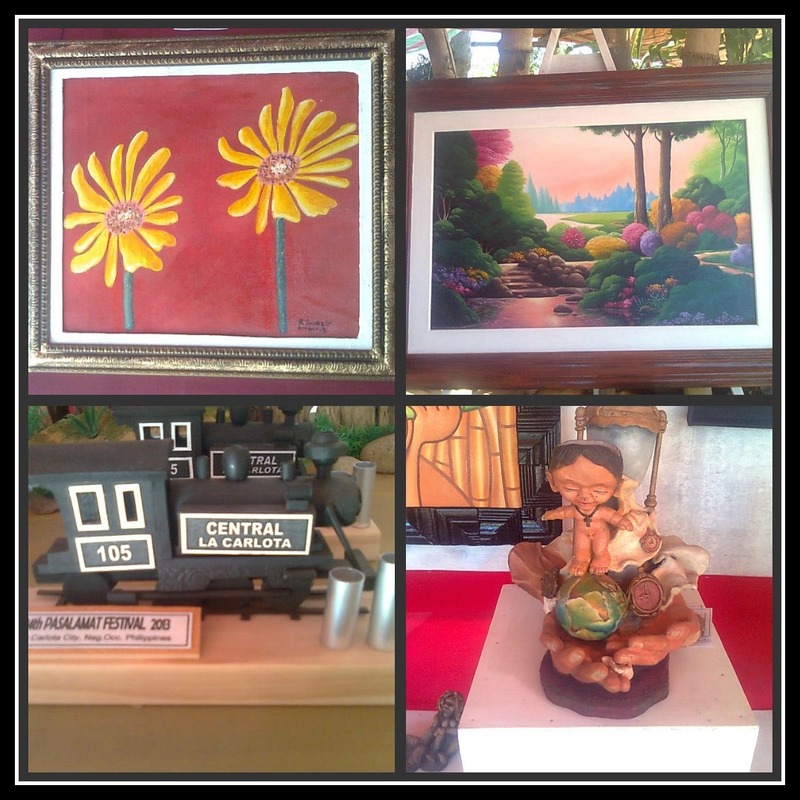 It launches its first group activity by exhibiting their best artworks in this year Pasalamat Festival of La Carlota. TMAG is composed of four talented artists who come up with a works of their own concept of imagination, which they display them at the Agro-Trade Fair booth in La Carlota City. I came across with this group when I happened to pass by with their own booth, while covering some day-to-day activities of La Carlota Pasalamat Festival this year. As what the common saying says: "Birds of the same feather flock together" That's it, their common interest which is practical arts and different media of artworks bring them together and form this group, Tib-ong Mangkas Art Group. Thus, they were proud to be addressed as such for they all residence of La Carlota City. 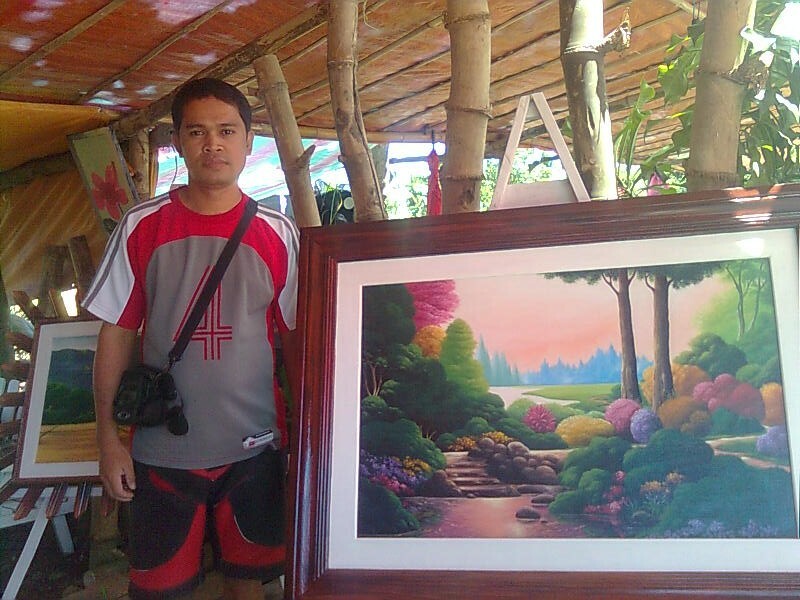 The first artist who is a bit older among the group is Abraham Obero, 35 of Purok Langka, San Agustin Street, La Carlota City. He is skillful in landscape painting. It was in 2008 that he formally launched his first painting. This skill he has was enhanced by his friends who are artist whom he always came into contact every time he took his coffee break in their place. 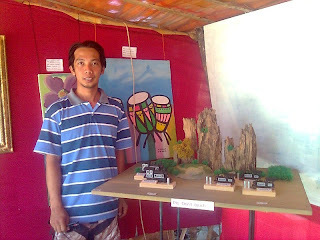 The second is an expert in making miniature skill model, souvenir painting, and even drawing. He is Alfred A. Chavez, 35 of Corner J.M. Basa and Ogatis Streets, La Carlota City. Since his childhood, drawing and indulging in different kinds of artwork were already his interest. A jolly, full of wits and wisdom and friendly, easy to talk with comes next. He is Raffie Salazar, 29, an education graduate. He lives in Brgy. Batuan, La Carlota City. 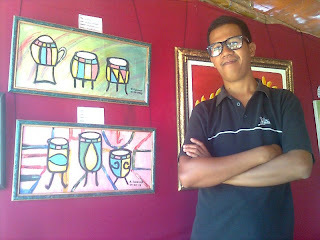 He is best in flower and drum painting and doing some souvenir items. His interest in arts started when he was a kinder pupil in which he was interested in flower art. His break in painting was tapped when he joined with his friends in Rollo y Pinta contest. And the fourth artist is the youngest of them all. He excels in sculpture using clay as his medium. He is good also in painting, in a mixed media and other kinds of arts and advertisement. 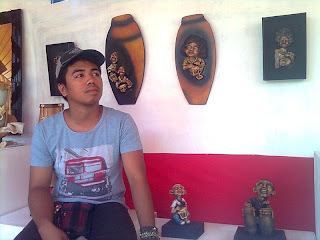 He is Redmond S. Nazareno, 25, the son of a noted La Carlota T-shirt printing and poster-making artist Rex Nazareno. He lives in relocation site at Paet, La Carlota City. He started this kind of artwork when he was in high school. You may contact them in your souvenir needs, birthday/wedding tokens, wall paintings/murals, among others. Fellow Mangkasanon and Negrense, let's help and promote these budding artists from La Carlota. Right now, they have an exhibit of their works at La Carlota Pasalamat Festival booth, near the gymnasium of La Carlota City. These exhibits will be up to April 28, 2013. What a great community it looks like to have Filipino artists united this way. :) Well done! such beautiful art. i love sunflowers too and been wanting to have a painting of it. They are really great artists. They would be great in coming up with souvenirs and portraits. Local artists deserve all the support they can get, especially if they are very talented. Their work needs to be seen by the public more. It's nice of you to help promote their art. It's not easy to find such art group in Singapore. Actually, I suspect there's no such artists! Never heard of this group until today. Hopefully,the national media can give them some sort of feature to spread the word about their group and what they can offer. Very impressive art, even though I never heard of them before, but looks like it's time to get to know their artistic work more now.. I like the fact that they offer a unique artistic perspective with their work. I enjoyed hearing about them and love the creativity you shared with us. Very nice! I can sense you have an utmost pride for all the Filipinos! Wow there are some great pieces of art here. it is great to see how other cultures approach art and design.